To Cite: Salehian B, Liem S Y, Mojazi Amiri H, Maghami E. Clinical Trials in Management of Anaplastic Thyroid Carcinoma; Progressions and Set Backs: A Systematic Review, Int J Endocrinol Metab. Online ahead of Print ; 17(1):e67759. doi: 10.5812/ijem.67759. Context: Anaplastic thyroid carcinoma (ATC) is associated with rapid tumor growth and extremely poor prognosis. Although ATC is found in only 2% of all thyroid carcinomas, it accounts for up to 50% of thyroid cancer mortality. Objective: To understand the effect of different treatment modalities upon anaplastic thyroid cancer outcomes. Methods: A systematic review of studies from 1995 to 2017 was performed employing the search terms “anaplastic thyroid” and “treatment” in PubMed. Studies comparing patients receiving any type of therapy for ATC and measuring either survival as primary outcome or the percentage of patient surviving more than 1 year as secondary outcome were included for review. We did not limit sample size or subject condition. A total of 40 articles were returned from our database search, of which 25 met the inclusion criteria. Results: A review of the 25 published studies indicated that early multidisciplinary approaches using extensive radical surgery, in combination with adjuvant chemo-radiation using either docetaxel/pacitaxel or cisplatin, provided the best chance of disease control. Targeted multi-tyrosine kinases inhibitors helped to limit disease progression. Also, the finding of foci of differentiated thyroid cancer within the anaplastic tumor was associated with increased long-term survival. Conclusions: ATC remains a fatal disease. Despite aggressive therapy the median survival has not significantly changed over the last 20 years. However, the percentage of patients surviving longer than 1 year continues to increase. Novel approaches incorporating multiple targeted therapy and immune therapies are critically needed. By definition, anaplastic thyroid carcinoma (ATC) is an undifferentiated thyroid cancer that exhibits immunohistochemical or ultrastructural features indicative of epithelial differentiation. ATC is a rare cancer representing only 1% - 2% of thyroid carcinomas. However, it is considered the most lethal thyroid cancer, accounting for thirty-eight to fifty percent of all thyroid cancer mortality. The median survival is poor (3 - 10 months) (1), likely due to rapid growth (20 - 24 hour doubling time in cell culture (2, 3) and observed radio- and chemo-resistance. In the limited space of the neck, anaplastic thyroid cancer rapidly invades vital neurovascular and visceral structures and becomes a real challenge for all modalities of therapy. To date, we still do not have a treatment paradigm that significantly changes the course of this disease or improves outcomes. In this review, we examined the results from well-designed studies with different interventions, to find a meaningful improvement in the median survival of the patient with this difficult and fatal disease. We performed a systematic review in accordance with the PRISMA (preferred reporting items for systematic reviews and meta-analyses) guidelines (4). Articles reviewed and included were from 1995 until 2017 (algorithm 1). Two authors (BS and SYL) independently searched databases of PubMed. We used the search term “anaplastic thyroid” combined with “treatment”. There was no language restriction. We also excluded non-human studies and review publications. In addition, the title and abstract of the reference lists of the included studies were screened. The date last searched was 11/02/2018 and additional information provided. We included studies that met all of the following criteria: (i) Comparing patients receiving any type of therapy pertaining to anaplastic thyroid cancer (ii) measuring survival as primary outcome or percentage of patient surviving more than 1 year as secondary outcome. We did not limit sample size or subject condition. One author (BS) assigned the study level of evidence. Case reports, review articles, and non-therapy related reports were excluded (Figure 1). Data were extracted from full-text articles independently by three review authors (BS and SYL and HMA) using a standardized form. Disagreements were identified and discussed with the third author (BS). The extracted information included author name, country where study was conducted, publication year, study methodology (study design, method of randomization, inclusion and exclusion criteria, primary and secondary endpoint, and dropout rate), patients’ baseline characteristics, and study interventions (surgery, chemotherapy, radiation therapy, combined therapy). The outcomes of each study were extracted and compared. The studies chosen for this review are categorized based on the levels of evidence (Table 1). I Evidence obtained from meta-analysis of multiple, well-designed, controlled studies. Randomized trials with low false-positive and low false-negative errors (high power). II Evidence obtained from at least one well-designed experimental study. Randomized trials with high false positive and/or negative errors (low power). III Evidence obtained from well-designed, quasi-experimental studies such as non-randomized, controlled single group, pre-post, cohort, time or matched case-control series. IV Evidence from well-designed, non-experimental studies such as comparative and correlational descriptive and case studies. V Evidence from case reports and clinical examples. A total of 40 articles were reviewed and 25 articles met criteria for inclusion. These included clinical trials, meta-analysis, prospective cohorts and retrospective chart reviews. For some cases of ATC, surgery may impact outcome. In a Japanese cohort of 677 patients (547 patients with common type ATC and 130 patients with other types-incidental anaplastic carcinoma, anaplastic transformation in lymph node and transformation in distant metastasis (5), the extent of surgery clearly modified the observed outcomes (level of evidence III). Patients in stage IVA (n = 69), IVB (n = 242) and IVC (n = 223) who had radical surgery had significantly higher median survival days, and 6 months and 1-year survival rates compared to patients in the same stage with palliative or no surgery. However, patients were not randomly assigned to radical surgery, so a selection bias should be taken into consideration. Another retrospective single institution study from Finland demonstrated a similar outcome for 44 patients with anaplastic thyroid cancer (level of evidence III) (6). The median survival among patients with ATC was 3.1 months. Long term survivors were stage N0M0 at presentation. Patients who underwent radical surgery had a longer median survival (11.6 months) compared to patients who underwent palliative surgery (3.2 months). In addition, patients who had multimodal therapy had a longer median survival (11.8 months) (level III evidence) (6). Similarly, in a 25-year retrospective study from a single institution (Memorial Sloan Kettering Cancer Center) (7), the medical records of 83 patients were analyzed. Median survival time was 8 months. The disease specific survival rate was 33% for 1 year and 23% for 2 years. The group without therapy only survived 2 months. Absence of residual gross tumor (R0 or R1) after surgery was associated with the best outcomes. Patients without gross residual disease after resection were 2 times less likely to die compared to those with gross residual tumors (R2/X) after resection (level IV evidence). Additional statistically significant predictors of improved survival were age less than 60 years, clinically N0 neck, absence of clinical extra thyroidal extension, and multimodality treatment (7). In a study by Sugitani et al. (8) 233 patients with stage IVB were evaluated retrospectively. Outcomes of patients who underwent super-radical resection (n = 23) were compared to patient who underwent curative surgery (n = 49), palliative surgery (n = 72) or no surgery (n = 80). The one-year cause-specific survival rate for patients who underwent super-radical surgery was similar to patients who underwent restricted curative surgery, and significantly better than patients who underwent palliative surgery or no surgery (level IV). Unfortunately, because most patients have extensive disease at initial diagnosis, a large percentage of ATC patients may be inoperable or operable for palliation alone. As expected in any observational study, the selection of patients for surgery would have an impact on the outcome and represents a selection bias. Nonetheless, once the indication for surgery is confirmed, rapid tumor extirpation with no residual disease should be the goal. Due to the rapid tumor expansion often observed in ATC patients, urgent examination and tumor imaging are also essential. Tumor biology suggests that there is only a narrow window from diagnosis and the ability to achieve a definitive surgical intervention. Loss of this window is likely to allow for airway palliation only. Paclitaxel as a single agent is used for treatment of ATC. Paclitaxel is one of several cytoskeletal drugs that target tubulin (Figure 2). In a two dose randomized phase 2 clinical trial including 20 patients, 120 mg/m2 or 140 mg/m2 of paclitaxel was infused for 96 hours. Because of rapid tumor proliferation, the durability of response at 2 weeks was chosen as the primary endpoint of the study. Among 19 evaluable patients, 1 patient had complete response and 9 patients had partial response at 2 weeks. Paclitaxel was the first single agent found to have significant activity against ATC; however, it does not alter the lethality of the disease (level of Evidence II) (9). In a study done by Onoda et al. (10) feasibility and efficacy of weekly paclitaxel administration in patients with ATC was investigated. Fifty-six patients were treated with weekly paclitaxel. The median overall survival was 6.7 months, and 6 months survival rate was 54%. None of the patients with an evaluable lesion reached complete remission. Partial remission was reached in 21%, stable disease was seen in 52%, and progressive disease was seen in 19% of the patients (level of evidence III). In 1995 the Japanese Society of Thyroid Surgery published a combined modality chemotherapy regimen including cisplatin, doxorubicin, etoposide, and peplomycin with support of granulocyte colony-stimulating factor (G-CSF) (11). In this pilot study, 17 ATC patients with an average age of 66 years received combination therapy every 3 weeks. The treatment consisted of drip intravenous infusion (DIV) of cisplatin (40 mg/m2) on day 1, doxorubicin (60 mg/m2) on day 1, etoposide (100 mg/m2/day) on days 1 - 3, subcutaneous (SC) injection of peplomycin (5 mg/kg/day) on days 1 - 5, and SC injection of G-CSF (2 µg/kg/day) on days 6 - 14. Local radiation therapy was added for patients in whom it was indicated. Among 10 patients who had a measurable lesion with advanced disease, only 2 patients experienced partial remission lasting 2 to 3 months. Six of seven patients were treated with the same modality of treatment as an adjuvant to surgery. Three died of progressive disease after 3 - 7 months, and 3 others survived for 3 - 11 months. Bone marrow toxicities were the major limiting factor despite use of G-CSF administration. The overall poor outcome of the study (none of the patients survived beyond 11 months) coupled with severe toxicity makes it a less attractive approach for ATC treatment (level of evidence II) (11). Radiation therapy has been considered in the management of ATC. In a meta-analysis done by Kwon et al. (12) seventeen retrospective studies including 1147 patients were analyzed. This study showed that post-operative radiation therapy significantly decreased mortality in patients with resected ATC compared with those with surgery alone (HR, 0.556; 95% confidence interval, 0.419 - 0.737; P < 0.001). It also showed that patients with stage IVA and IVB may have a survival benefit from post-operative radiation therapy, but not patients with stage IVC of ATC. In a study of National Cancer Data Base (NCDB) (13), patients who underwent either no surgery or grossly incomplete resection were evaluated. The study found a positive radiation therapy dose-survival correlation for the entire study cohort, patients who received systemic therapy, and patients with stage IVA/IVB and IVC disease. On multivariate analysis, older age, ≥ 1 comorbidity, distant metastasis, receipt of systemic therapy, and receipt of radiation therapy compared with no radiation therapy correlated with overall survival (level of evidence I). However, patients were not randomly assigned to treatment groups in this study and selection bias should be considered. In a study conducted between 1991 and 1995, 17 patients received standard radiation therapy given twice daily using photons of 5 - 8 MV (1.8 Gy a.m. and 2.0 Gy p.m.). Treatment was given 5 days a week with a minimum 6-hour gap between fractions to permit adequate normal tissue repair. The initial phase comprised of 30.4 Gy in 16 fractions over 10 - 12 days. The second phase followed without a gap, using a computerized tomography (CT) planned volume to the sites of initial disease to give another 30.4 Gy in 16 fractions in 10 - 12 days. Field arrangements were chosen to ensure that the total spinal cord dose did not exceed 40 Gy. All 17 patients died between 1.5 to 20 months after diagnosis. A single patient achieved complete local response but died 20 months later from metastasis. Approximately 6 weeks passed from the start of accelerated radiation therapy to time of recovery from grade 3 and 4 toxicity. Complete or partial response was achieved in 10 patients, but it was short-lasting with the median survival of only 10 weeks. Significant radiotoxicity and the small benefit gained from radiotherapy renders this, as a single modality therapy, unadvisable (level of evidence III) (14). Combination chemo-radiation therapy (CRT), preferably following neck surgery, has been evaluated in multiple small series of patients with ATC. Different chemotherapy combinations together with 45 - 60 Gy of radiation therapy have been reported. Cisplatin, doxorubicin, and 5-fluouracil, in combination, showed substantial undesirable toxicities (level of evidence III) (15). The addition of docetaxel weekly to radiation therapy showed a local control benefit, although, it did not ultimately impact metastatic progression and was associated with a short survival rate (level of evidence III) (16). The partial improvement of outcome in resectable, not yet metastasized, ATC observed with the addition of docetaxel may be due to a radiosensitization effect. Intensity modulated radiation therapy (IMRT) using a 2 Gy daily fraction up to a total dose of 60 Gy in combination with weekly 10 mg/m2 docetaxel, starting at day 1, was able to control disease in a small group of 6 patients. Complete remission was achieved in 2 patients while partial remission was achieved in 3 patients. A single patient displayed stable disease. The median duration to progression in this small cohort was 154 days (level of evidence IV) (16). Multimodality therapy was associated with longer survival in a study of 83 patients with ATC over 25 years (level of evidence III). In this study, age less than 60 years old, lack of extrathyroidal extension, and N0 neck stage were also associated with better outcomes (5). Mayo Clinic reported on a retrospective cohort of 48 patients, 18 receiving palliative intent, and 30 treated with multimodal therapy including surgery when feasible, combination taxane-based chemotherapy, and intensity modulated radiation therapy (17). Overall survival for patients who received multimodal therapy was 9 months vs. 3 months in patients with palliative therapy. However, in patients in stage IVC, overall survival did not significantly differ with therapy (18). In a report from Japan of combination chemo-radiotherapy for ATC with cisplatin, 5-fluorouracil and doxorubicin, a 6-month survival rate of 57% (12 from total 21 patients) was achieved, and 33% (7 patients) survived more than 1 year (15). The regimen consisted of external beam irradiation (40 Gy at 2 Gy/day) combined with concurrent low-dose cisplatin at 5 mg/m2 (days 1 - 5, 8 - 12, 15 - 19 and 22 - 26), 5-fluorouracil at 200 mg/m2 (days 1 - 26), and doxorubicin at 20 mg/m2 (days 1 and 15). Mean survival time was 11 months (range 1 - 43 months). Prognostic index (PI) was determined by any acute treatment symptoms, tumor size (> 5 cm), distant metastasis, and WBC count (WBC ≥ 10,000/mm3). A single patient with partial response, prognostic index (PI) = 0, survived 2 years and 9 months. Radiosensitizing chemotherapy was effective for patients with low prognostic index (PI ≤ 1) as part of aggressive therapy, and for patients with high prognostic index (PI ≥ 3) for palliative intent. Adverse effects for CRT related toxicities were mainly grade 2 or grade 3 with the most common adverse effect being leucocytopenia which was observed in 11 patients (52%) (level of evidence III) (19) . For two cases, complete eradication of the anaplastic tumor in the neck was observed after radical neck surgery and postoperative chemoradiation. However, new metastatic lesions in the lungs were discovered a few months later. In the Memorial Sloan-Kettering experience, the absence of clinical extrathyroidal extension, use of multimodality therapy, and gross total resection were predictors of improved outcome. Patients treated with multimodality therapy were 3 times less likely to die (level of evidence III) (7). Data from this series suggested that chemosensitizing radiation therapy prolonged survival (level of evidence IV), and that the presence of element differentiation in the tumor or in the metastatic lesions had a positive impact on improving survival (Table 2). Fosbretabulin, also known as combretastatin A-4 phosphate (CA4P), is a stilbenoid phenol derived from the African bush willow. It is a prodrug that dephosphorylates in vivo to form combretastatin, which binds to tubulin dimers. This action prevents dimerization and polymerization of microtubules in endothelial cells which otherwise would lead to apoptotic cell death. Fosbretabulin is a vascular-disrupting agent (VDA) that negatively affects blood supply to tumor cells, to deprive them of oxygen and nutrients and promote tumor necrosis. In a phase 2 trial, twenty-six patients received 45 mg/m2 of fosbretabulin as a 10-minute intravenous infusion on days 1, 8, and 15 (21). Fosbretabulin was well tolerated having 9 patients (35%) with grade 3 toxicity and 1 patient (4%) with grade 4 toxicity. One out of four patients with QTc prolongation had to stop treatment (level of evidence III) (21). The median survival time was 4.7 months (95% CI, 2.5 - 6.4 months) while 6-month survival was 34% and 1-year survival was 23%. In a phase 2 study of 80 patients, combination chemotherapy using carboplatin and paclitaxel (CP) was tested with and without fosbretabulin. Patients were randomly assigned into two groups (24). For the first group, fosbretabulin (60 mg/m2) was administered every cycle (days 1, 8, and 15) combined with paclitaxel (200 mg/m2) and carboplatin area under the curve (AUC) (6 mg/mL/min) (day 2 every 3 weeks) (fosbretabulin + CP) for 6 cycles. For the second group, 6 cycles of paclitaxel (200 mg/m2) and carboplatin AUC (6 mg/mL/min) were given on day 1 every 3 weeks (CP alone). After 6 cycles, patients in the fosbretabulin + CP group that did not show progression could continue fosbretabulin on day 1 and 8 of a 3-week schedule until progression. The median survival for the fosbretabulin + CP group was 5.2 months compared to only 4 months for the CP alone group (P = 0.22). For both groups, the median survival was less than 6 months, and there was no significant improvement in any outcome measured. The only difference between the two groups was the percent of patients who survived more than one year, 26% in fosbretabuline + CP compared to 9% in CP alone. The regimen was well tolerated (level of evidence II) (21). Peroxisome proliferator-activated receptor gamma (PPAR-γ) agonists induce insulin sensitivity through adiponectin pathway. They also promote differentiation of preadipocytes to adipocytes, and activate PPAR-γ, which promotes terminal differentiation of certain tumor cells. Among PPAR-γ activators, the compound CS-7017 (efatutazone) (22), a selective PPAR-γ activator with 40 times more potency to activate PPAR-γ receptor compared to rosiglitazone, has a strong differentiating effect, preventing the proliferation of ATC in both cell culture and preclinical xenograft models. In a Phase 1 study of 14 participants with solid tumor, edema and anemia were the most significant and common side effects and no limiting toxicity was observed (level of evidence III) (25). The recommended dose was 0.5 mg BID. A single patient achieved partial remission, and 3 partial responses were observed. A multicenter Phase 2 study of efatutazone (3 different doses) with 2 doses of paclitaxel (either 135 or 175 mg/sqm) was reported from Mayo Clinic. The median times to disease progression were 48 and 68 days in patients who received 0.15 mg and 0.3 mg of efatutazone with paclitaxel, respectively, and the corresponding median survival was 98 vs. 138 days (level of evidence II) (26). Two subjects (stage IVC) received eftutazone 0.5 mg BID alone and incurred progressive disease. The clinical use of efatutazone was discontinued in 2015 (level of evidence III) (20). Sorafenib is the first oral multi-kinase inhibitor developed that targets Raf kinases (Raf-1, wild-type B-Raf and b-raf V600E) mutations, receptor tyrosine kinases associated with angiogenesis such as vascular endothelial growth factor receptor (VEGFR) 1 -2 and -3, platelet-derived growth factor receptor (PDGFR)-β, and receptor tyrosine kinases associated with tumor progression (Flt-3, c-kit). Favorable clinical experience led to approval of sorafenib for treatment of radioiodine-resistant metastatic papillary thyroid carcinoma. Use of sorafenib as an oral small-molecule tyrosine kinase inhibitor, which also blocks VEGFR-1, -2 and -3 (23, 27), was investigated in ATC patients in a phase 2 study with 20 patients. Sorafenib at 400 mg twice a day achieved partial response in 2 patients and disease stabilization in 5 patients. Median progression free and overall survival was 1.9 months (CI 1.3 - 3.6 months) and 3.9 months (CI 2.2 - 7.1 months), respectively. The 6-months and 1-year survival rates were 30% and 20%, respectively. Anemia and hyponatremia were the most common side effects (level of evidence III). Pazopanib is an oral tyrosine kinase inhibitor that blocks VEGFR. Pazopanib demonstrated impressive activity in progressive metastatic differentiated thyroid cancer (DTC), but in a multi-instutional phase 2 trial of advanced ATC, pazopanib monotherapy demonstrated minimal clinical benefit in 15 patients without confirmed RECIST tumor responses. The treatment was discontinued because of disease progression (12 patients), intolerability (2 patients) and death on study (1 patient). Median time to progression and survival were 62 and 111 days, respectively. Two patients were alive with progressive disease 9.9 months and 2.9 years after registration. The most common severe adverse effects were hypertension (13%) and laryngopharyngeal pain (13%) (level of evidence III) (28). Lenvatinib is an oral inhibitor of VEGFR 1, 2, and 3, fibroblast growth factor receptors 1 through 4, platelet-derived growth factor receptor α, RET, and KIT. In an open-label, non-randomized, multicenter, phase II study of 11 patients with ATC, lenvatinib had a safety profile comparable to previous clinical studies and had manageable toxicity using dose reduction and interruption. Lenvatinib demonstrated promising anti-tumor activity with 3 patients showing an objective response rate and 7 patients showing stable disease. The median progression free survival and median overall survival times were 7.4 and 10.6 months, respectively (level of evidence IV) (29). Also a case report from Japan showed significant amelioration of tracheal stenosis following lenvatinib in a patient who had ATC with bronchial and mediastinal infiltration. The patient had failed radiation and chemotherapy prior to receiving lenvatinib (30). A phase II trial of lenvatinib, an open label, single arm, multi-center study for the treatment of ATC was prematurely stopped due to not reaching the minimum outcome expected. In May 2018, United States Federal Drug Agency (FDA) approved the combination of dabrafenib plus trametinib for the treatment of ATC with BRAF (B-Raf Proto-Oncogene, Serine/Threonine Kinase) mutation. Dabrafenib is an inhibitor of some mutated forms of BRAF kinases of V600E (IC50 of 0.65 nM), V600K (0.5 nM) and V600D (1.84 nM). Dabrafenib also inhibits wild type BRAF and CRAF kinases. Dabrafenib and trametinib target two different kinases in the RAS/RAF/MEK/ERK pathway (Figure 3). Figure 3. 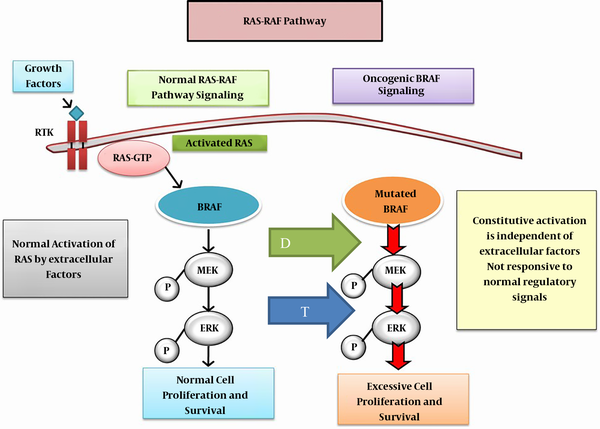 Oncogenic BRAF signaling: The mutated BRAF, constitutively activates MEK and ERK phosphorylation and pathway activation which at the signals cell proliferation. Inhibition of MEK pathway by trematinib (blue arrow T) and blockage of mutated BRAF by dabrafenib (green arrow D) suppresses constituve action of the mutated BRAF, further inhibiting at two levels the molecule-pathological pathway. Abbreviations: MEK, mitogen-activated extracellular signal-regulated kinase; ERK, extracellular signal-related kinase. In a phase II study of dabrafenib and trematinib, the overall response rate was 69% among 16 patients who enrolled in this study, with a median follow-up of 47 weeks. All patient had unsuccessful prior therapy including surgery/and or radiation therapy or other systemic modalities of therapy (level of evidence: II) (31). The FDA decision was based on the nine cohort of non-randomized trial of advanced, or non-surgically resectable, or metastatic ATC where no other loco-regional alternative therapy option (32, 33). A complete response was observed in 4% of patients and partial response in 57% for an overall response rate of 61% (95% CI 39% - 80%). All 23 patients had the BRAF mutation. The response of 6 months duration lasted in 64% of the responders. Adverse reactions were similar to other previously approved modalities of therapy. The dose employed in these studies was dabrafenib 150 mg PO twice daily and trametinib 2 mg once daily. These studies showed for the first time that in ATC a combination therapy changed the course of the disease, albeit to a modest degree, but is nonetheless, considered a significant advance in care for, what is otherwise, a rapidly fatal disease (31). A major side effect of dabrafenib is cardiomyopathy and secondary congestive heart failure. Therefore, left ventricular ejection fraction needs to be assessed before and monitored during therapy. Other major side effects of dabrafenib are uveitis, hyperpyrexia, severe hyperglycemia and serious skin toxicity. 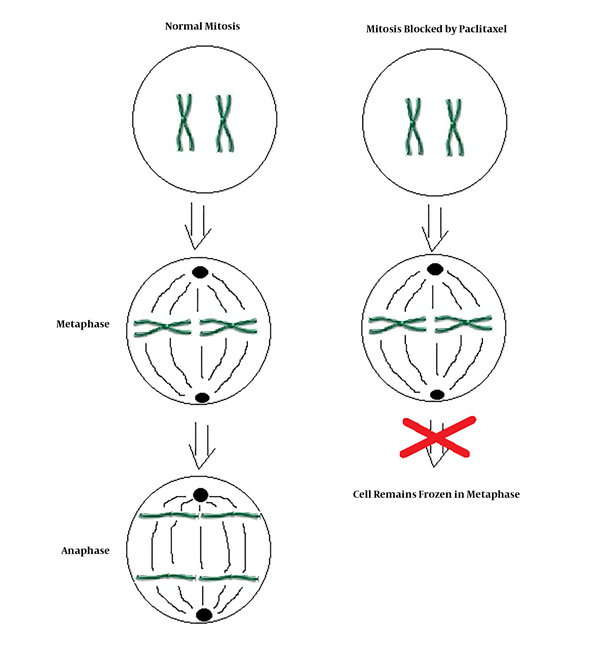 It is important that patients with ATC who are treated with dabrafenib have the BRAF mutation since absence of the mutation may increase the risk of accelerated tumor proliferation. Trametinib is a reversible mitogen-activated extracellular signal-regulated kinase 1 (MEK1) and MEK2 inhibitor. MEK 1 and MEK 2 are upstream of extracellular signal related kinase (ERK) pathway. ERK promote cell proliferation. Interestingly, BRAF V600 E is autonomously and constitutively activates BRAF pathway, which in turn induces activation of MEK1 and MEK2. The major side effects of trametinib are colitis and gastrointestinal perforation, deep vein thrombosis, retinal vein thrombosis and left ventricular dysfunction with cardiomyopathy. Also, hyperpyrexia is more frequent when trametinib is used in combination with dabrafenib. Embolization of the superior and/or inferior thyroid arteries was studied in 7 patients with inoperable ATC. Palliation was observed in breathing (6 patients), swallowing (2 patients), and pain control (4 patients). Stridor disappeared in 2 patients, and bleeding from the tumor stopped in another 2 patients. Five patients felt improvement in their general condition (level of evidence V) (32, 33). Palliative embolization with polyvinyl alcohol was shown to be safe and conferred a palliative effect. Such treatment may have additional benefits and should be considered prior to surgery. Treatment of ATC is challenging and most of the time unsuccessful. Early and urgent multidisciplinary approaches using extensive radical surgery, in combination with adjuvant chemoradiation with either docetaxel/pacitaxel or cisplatin, provides the best chance of disease control. Despite the use of aggressive therapy, median survival has not significantly changed over the last 20 years. However, the percentage of patients surviving longer is increasing. One has to consider the best balance of disease control and preservation of function for the patient. Aggressive laryngotracheal resection or esophageal resection may be justified if a complete resection can be achieved with a chance for long-term survival and reasonable function. Based on our experience, rapid intervention and extensive operation might be a factor for prolonged survival. Unfortunately there were no double blind placebo controlled trials returned in review of the PubMed data base. This increases the risk of bias in interpretation of results. Our limited experience with lenvatinib needs to be explored systematically in a prospective double blind study. The combined use of dabrafenib and trematinib is limited to patients with BRAF mutation. Understanding the biology and natural course of ATC and familiarity with advanced resection and reconstruction techniques is essential. We need a better understanding of the underlying biological processes that lead to de-differentiation of thyroid cells. This may eventually provide clues leading to novel ways to intercept disease progression in this challenging cancer. We would like to express our appreciation to Chris Gandhi, PhD and Jeffrey Isenberg, MD, MPH for critical reading and editing of the manuscript and Marilyn Garcia for her technical assistance. Authors' Contribution: Behrouz Salehian: The concept, reviewing the literature and writing the manuscript, Simon Y Liem: Reviewing and analyzing the available literature, contributing in the writing of the manuscript, Hoda Mojazi Amiri: Updating the new information and contributing in writing the manuscript, Ellie Maghami: Contributing on surgical review of literature and critical discussion. Conflict of Interests: No conflict of nterest. Funding/Support: This research did not receive any specific grant from any funding agency in the public, commercial or not-for-profit sector. 1. Sun XS, Sun SR, Guevara N, Fakhry N, Marcy PY, Lassalle S, et al. Chemoradiation in anaplastic thyroid carcinomas. Crit Rev Oncol Hematol. 2013;86(3):290-301. doi: 10.1016/j.critrevonc.2012.10.006. [PubMed: 23218594]. 2. Ishiwata I, Ono I, Kiguchi K, Ishiwata C, Soma M, Ishikawa H. Establishment and characterization of a human thyroid carcinoma cell line (HOTHC) producing colony stimulating factor. Hum Cell. 2005;18(3):163-9. doi: 10.1111/j.1749-0774.2005.tb00007.x. [PubMed: 17022149]. 3. Narimatsu M, Nagayama Y, Akino K, Yasuda M, Yamamoto T, Yang TT, et al. Therapeutic usefulness of wild-type p53 gene introduction in a p53-null anaplastic thyroid carcinoma cell line. J Clin Endocrinol Metab. 1998;83(10):3668-72. doi: 10.1210/jcem.83.10.5160. [PubMed: 9768682]. 4. Moher D, Liberati A, Tetzlaff J, Altman DG, PRISMA Group . Preferred reporting items for systematic reviews and meta-analyses: The PRISMA statement. PLoS Med. 2009;6(7). e1000097. doi: 10.1371/journal.pmed.1000097. [PubMed: 19621072]. [PubMed Central: PMC2707599]. 5. Sugitani I, Miyauchi A, Sugino K, Okamoto T, Yoshida A, Suzuki S. Prognostic factors and treatment outcomes for anaplastic thyroid carcinoma: ATC Research Consortium of Japan cohort study of 677 patients. World J Surg. 2012;36(6):1247-54. doi: 10.1007/s00268-012-1437-z. [PubMed: 22311136]. 6. Siironen P, Hagstrom J, Maenpaa HO, Louhimo J, Heikkila A, Heiskanen I, et al. Anaplastic and poorly differentiated thyroid carcinoma: Therapeutic strategies and treatment outcome of 52 consecutive patients. Oncology. 2010;79(5-6):400-8. doi: 10.1159/000322640. [PubMed: 21455012]. 7. Mohebati A, Dilorenzo M, Palmer F, Patel SG, Pfister D, Lee N, et al. Anaplastic thyroid carcinoma: A 25-year single-institution experience. Ann Surg Oncol. 2014;21(5):1665-70. doi: 10.1245/s10434-014-3545-5. [PubMed: 24554064]. 8. Sugitani I, Hasegawa Y, Sugasawa M, Tori M, Higashiyama T, Miyazaki M, et al. Super-radical surgery for anaplastic thyroid carcinoma: A large cohort study using the Anaplastic Thyroid Carcinoma Research Consortium of Japan database. Head Neck. 2014;36(3):328-33. doi: 10.1002/hed.23295. [PubMed: 23729360]. 9. Ain KB, Egorin MJ, DeSimone PA. Treatment of anaplastic thyroid carcinoma with paclitaxel: Phase 2 trial using ninety-six-hour infusion. Collaborative Anaplastic Thyroid Cancer Health Intervention Trials (CATCHIT) Group. Thyroid. 2000;10(7):587-94. doi: 10.1089/thy.2000.10.587. [PubMed: 10958311]. 10. Onoda N, Sugino K, Higashiyama T, Kammori M, Toda K, Ito K, et al. The safety and efficacy of weekly paclitaxel administration for anaplastic thyroid cancer patients: A nationwide prospective study. Thyroid. 2016;26(9):1293-9. doi: 10.1089/thy.2016.0072. [PubMed: 27484330]. 11. Chemotherapy Committee, The Japanese Society of Thyroid Surgery. Intensive chemotherapy for anaplastic thyroid carcinoma: combination of cisplatin, doxorubicin, etoposide and peplomycin with granulocyte granulocyte colony-stimulating factor support. Jpn J Clin Oncol. 1995;25(5):203-7. doi: 10.1093/oxfordjournals.jjco.a039778. [PubMed: 7474408]. 12. Kwon J, Kim BH, Jung HW, Besic N, Sugitani I, Wu HG. 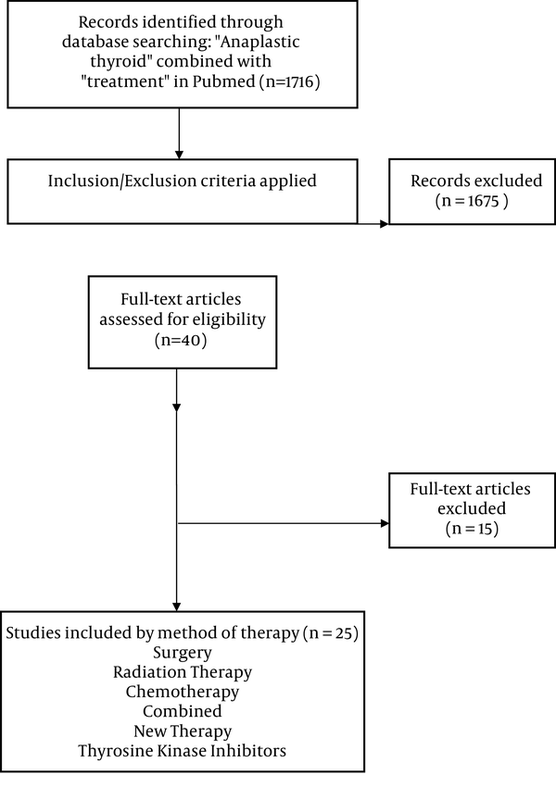 The prognostic impacts of postoperative radiotherapy in the patients with resected anaplastic thyroid carcinoma: A systematic review and meta-analysis. Eur J Cancer. 2016;59:34-45. doi: 10.1016/j.ejca.2016.02.015. [PubMed: 27014798]. 13. Pezzi TA, Mohamed ASR, Sheu T, Blanchard P, Sandulache VC, Lai SY, et al. Radiation therapy dose is associated with improved survival for unresected anaplastic thyroid carcinoma: Outcomes from the National Cancer Data Base. Cancer. 2017;123(9):1653-61. doi: 10.1002/cncr.30493. [PubMed: 28026871]. [PubMed Central: PMC5906051]. 14. Mitchell G, Huddart R, Harmer C. Phase II evaluation of high dose accelerated radiotherapy for anaplastic thyroid carcinoma. Radiother Oncol. 1999;50(1):33-8. doi: 10.1016/S0167-8140(98)00102-9. [PubMed: 10225555]. 15. Tanaka K, Sugitani I, Fujimoto Y. A novel chemo-radiotherapy with low-dose daily cisplatin, 5-fluorouracil and doxorubicin for anaplastic thyroid carcinoma: A preliminary report. Jpn J Clin Oncol. 2011;41(9):1074-8. doi: 10.1093/jjco/hyr095. [PubMed: 21791572]. 16. Onoda N, Kashiwagi S, Noda S, Kawajiri H, Takashima T, Ishikawa T, et al. High efficacy of chemoradiation therapy sensitized by weekly docetaxel for anaplastic thyroid cancer. Anticancer Res. 2013;33(8):3445-8. [PubMed: 23898117]. 17. Foote RL, Molina JR, Kasperbauer JL, Lloyd RV, McIver B, Morris JC, et al. Enhanced survival in locoregionally confined anaplastic thyroid carcinoma: A single-institution experience using aggressive multimodal therapy. Thyroid. 2011;21(1):25-30. doi: 10.1089/thy.2010.0220. [PubMed: 21162687]. 18. Prasongsook N, Kumar A, Chintakuntlawar AV, Foote RL, Kasperbauer J, Molina J, et al. Survival in response to multimodal therapy in anaplastic thyroid cancer. J Clin Endocrinol Metab. 2017;102(12):4506-14. doi: 10.1210/jc.2017-01180. [PubMed: 29029287]. 19. Orita Y, Sugitani I, Amemiya T, Fujimoto Y. Prospective application of our novel prognostic index in the treatment of anaplastic thyroid carcinoma. Surgery. 2011;150(6):1212-9. doi: 10.1016/j.surg.2011.09.005. [PubMed: 22136842]. 20. Williams R. Discontinued in 2013: Oncology drugs. Expert Opin Investig Drugs. 2015;24(1):95-110. doi: 10.1517/13543784.2015.971154. [PubMed: 25315907]. 21. Mooney CJ, Nagaiah G, Fu P, Wasman JK, Cooney MM, Savvides PS, et al. A phase II trial of fosbretabulin in advanced anaplastic thyroid carcinoma and correlation of baseline serum-soluble intracellular adhesion molecule-1 with outcome. Thyroid. 2009;19(3):233-40. doi: 10.1089/thy.2008.0321. [PubMed: 19265494]. [PubMed Central: PMC2913806]. 22. Shimazaki N, Togashi N, Hanai M, Isoyama T, Wada K, Fujita T, et al. Anti-tumour activity of CS-7017, a selective peroxisome proliferator-activated receptor gamma agonist of thiazolidinedione class, in human tumour xenografts and a syngeneic tumour implant model. Eur J Cancer. 2008;44(12):1734-43. doi: 10.1016/j.ejca.2008.04.016. [PubMed: 18511262]. 23. Krajewska J, Handkiewicz-Junak D, Jarzab B. Sorafenib for the treatment of thyroid cancer: An updated review. Expert Opin Pharmacother. 2015;16(4):573-83. doi: 10.1517/14656566.2015.1005601. [PubMed: 25605317]. 24. Sosa JA, Elisei R, Jarzab B, Balkissoon J, Lu SP, Bal C, et al. Randomized safety and efficacy study of fosbretabulin with paclitaxel/carboplatin against anaplastic thyroid carcinoma. Thyroid. 2014;24(2):232-40. doi: 10.1089/thy.2013.0078. [PubMed: 23721245]. 25. Murakami H, Ono A, Takahashi T, Onozawa Y, Tsushima T, Yamazaki K, et al. Phase I study of efatutazone, an oral PPARgamma agonist, in patients with metastatic solid tumors. Anticancer Res. 2014;34(9):5133-41. [PubMed: 25202104]. 26. Smallridge RC, Copland JA, Brose MS, Wadsworth JT, Houvras Y, Menefee ME, et al. Efatutazone, an oral PPAR-gamma agonist, in combination with paclitaxel in anaplastic thyroid cancer: Results of a multicenter phase 1 trial. J Clin Endocrinol Metab. 2013;98(6):2392-400. doi: 10.1210/jc.2013-1106. [PubMed: 23589525]. [PubMed Central: PMC3667260]. 27. Savvides P, Nagaiah G, Lavertu P, Fu P, Wright JJ, Chapman R, et al. Phase II trial of sorafenib in patients with advanced anaplastic carcinoma of the thyroid. Thyroid. 2013;23(5):600-4. doi: 10.1089/thy.2012.0103. [PubMed: 23113752]. [PubMed Central: PMC3643255]. 28. Bible KC, Suman VJ, Menefee ME, Smallridge RC, Molina JR, Maples WJ, et al. A multiinstitutional phase 2 trial of pazopanib monotherapy in advanced anaplastic thyroid cancer. J Clin Endocrinol Metab. 2012;97(9):3179-84. doi: 10.1210/jc.2012-1520. [PubMed: 22774206]. [PubMed Central: PMC3431569]. 29. Wetzler LM. The role of Toll-like receptor 2 in microbial disease and immunity. Vaccine. 2003;21 Suppl 2:S55-60. doi: 10.1016/S0264-410X(03)00201-9. [PubMed: 12763684]. 30. Fukuhara T, Donishi R, Koyama S, Miyake N, Matsuda E, Fujiwara K, et al. Significant amelioration of tracheal stenosis following lenvatinib in a patient who has anaplastic thyroid carcinoma with bronchomediastinal infiltration: A case report. Case Rep Oncol. 2017;10(1):175-81. doi: 10.1159/000457831. [PubMed: 28413394]. [PubMed Central: PMC5346947]. 31. Subbiah V, Kreitman RJ, Wainberg ZA, Cho JY, Schellens JHM, Soria JC, et al. Dabrafenib and trametinib treatment in patients with locally advanced or metastatic BRAF V600-mutant anaplastic thyroid cancer. J Clin Oncol. 2018;36(1):7-13. doi: 10.1200/JCO.2017.73.6785. [PubMed: 29072975]. [PubMed Central: PMC5791845]. 32. Food and Drug Administration. FDA approves dabrafenib plus trametinib for anaplastic thyroid cancer with BRAF V600E mutation. 2018. Available from: https://www.fda.gov/drugs/informationondrugs/approveddrugs/ucm606708.htm. 33. Dedecjus M, Tazbir J, Kaurzel Z, Lewinski A, Strozyk G, Brzezinski J. Selective embolization of thyroid arteries as a preresective and palliative treatment of thyroid cancer. Endocr Relat Cancer. 2007;14(3):847-52. doi: 10.1677/ERC-07-0011. [PubMed: 17914113].